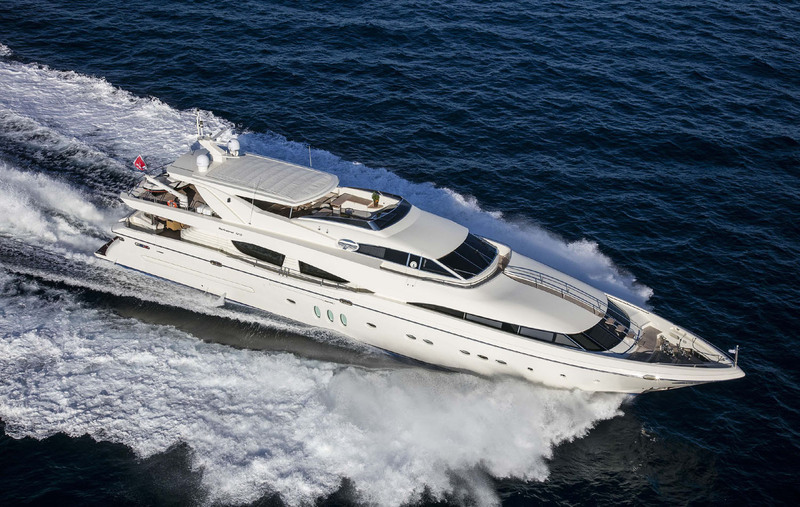 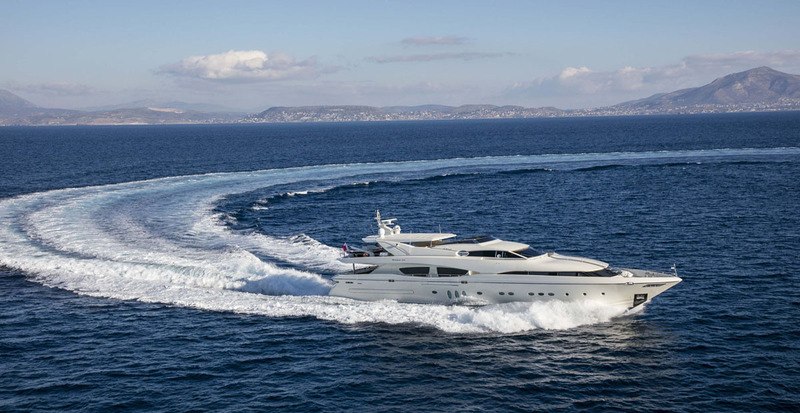 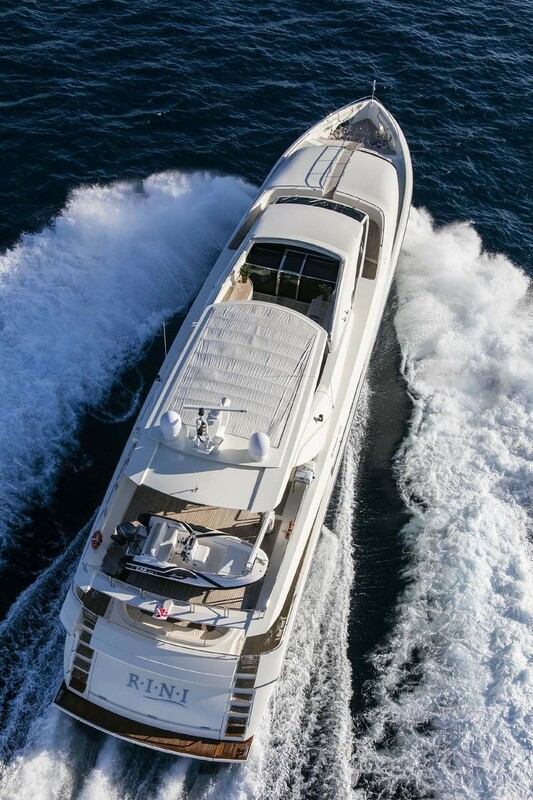 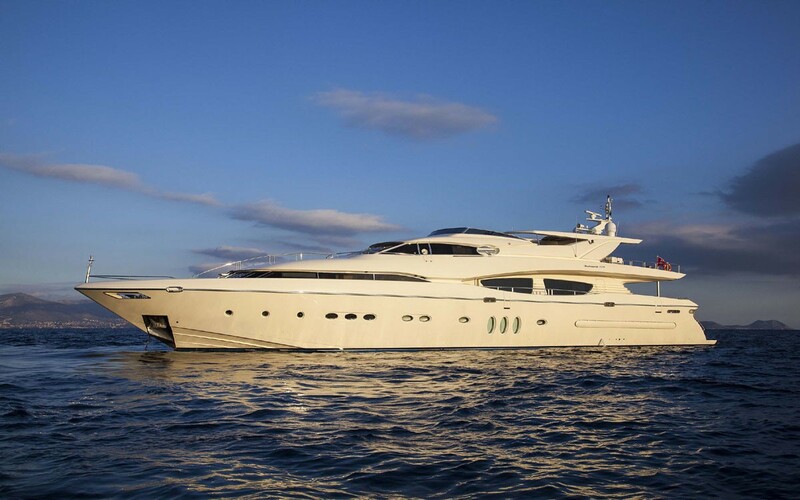 Motor yacht RINI is a 36,5m (120ft) Technema built by Posillipo yachts in 2009 and refitted in 2015. 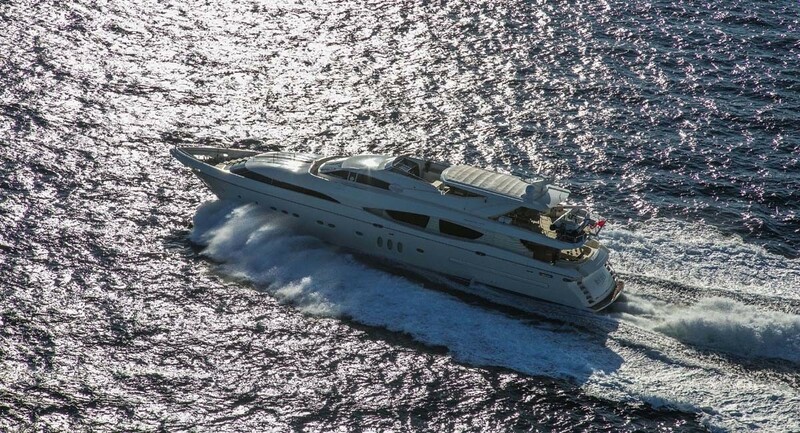 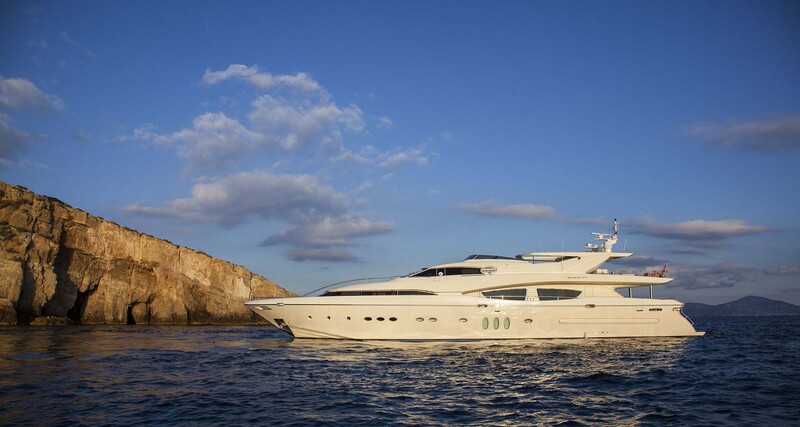 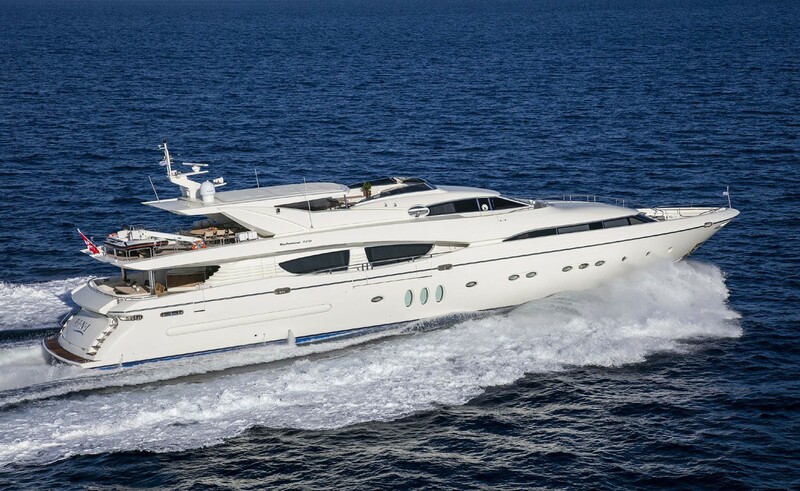 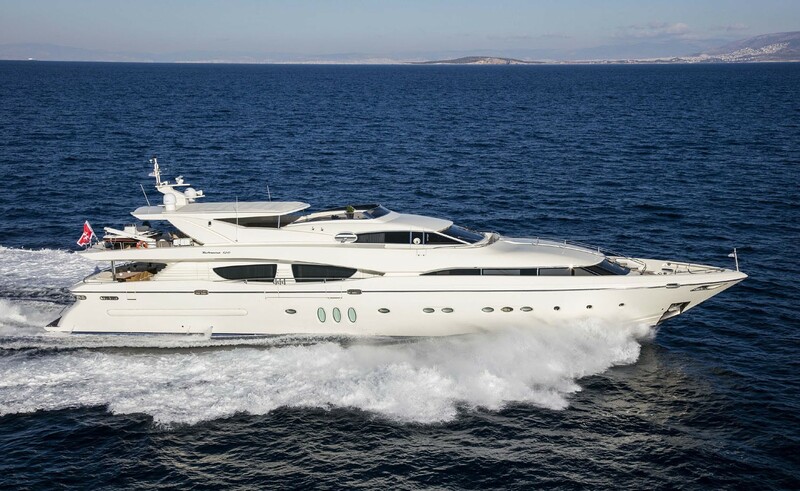 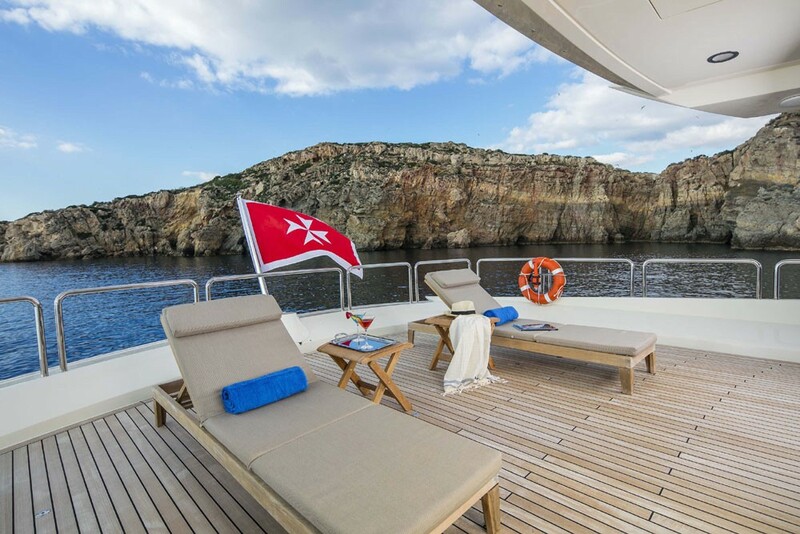 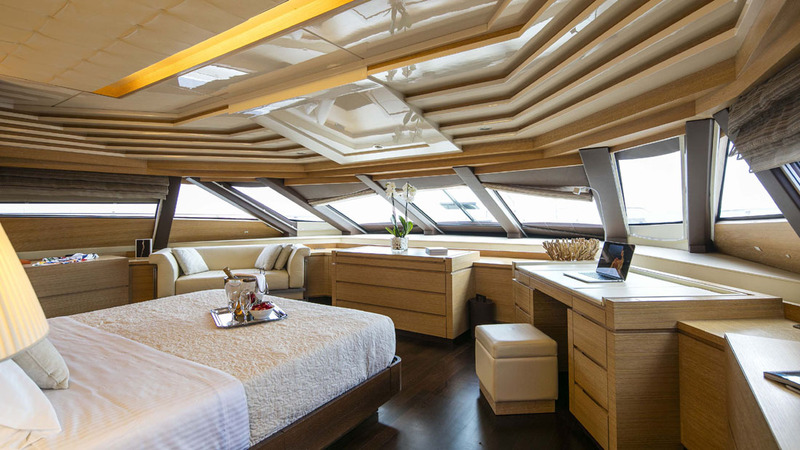 She can accommodate up to 12 charter guests, in 5 cabins. 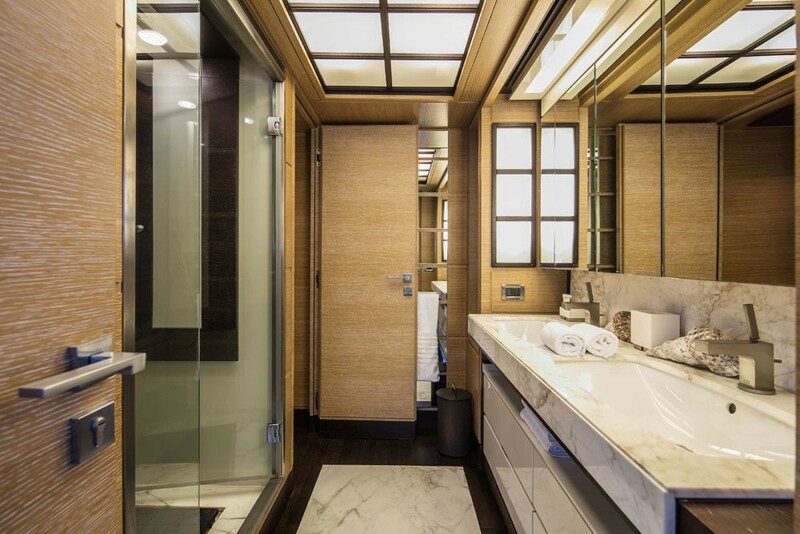 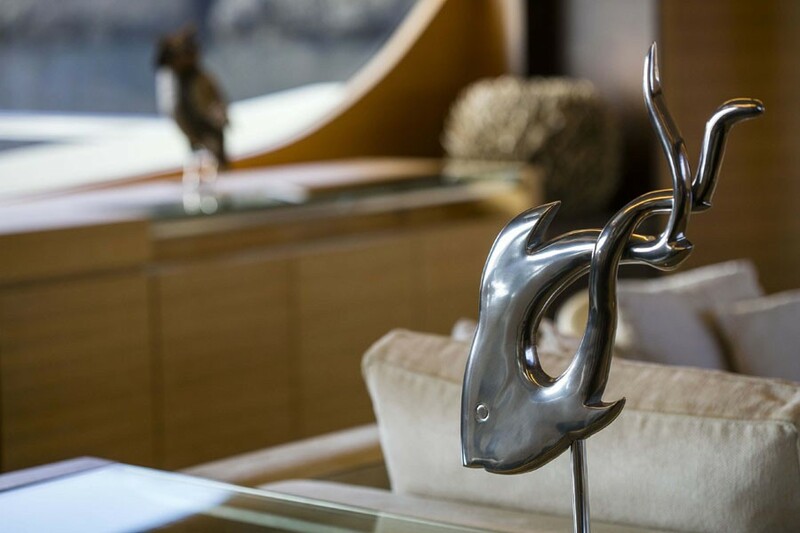 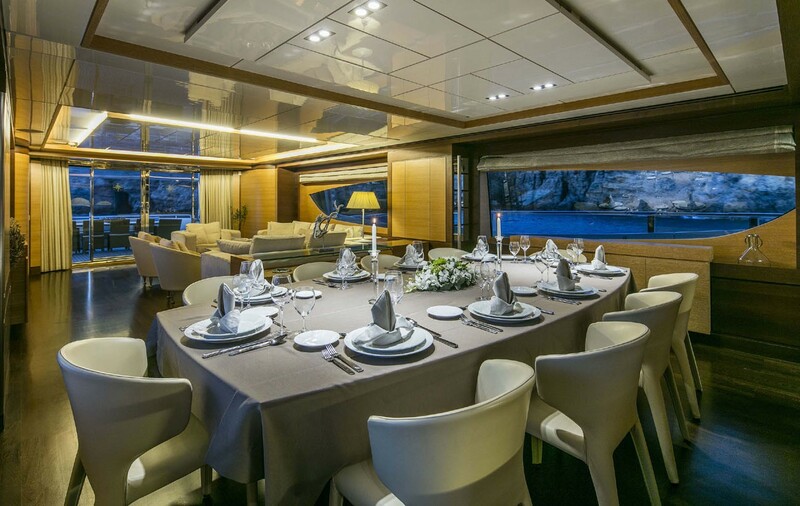 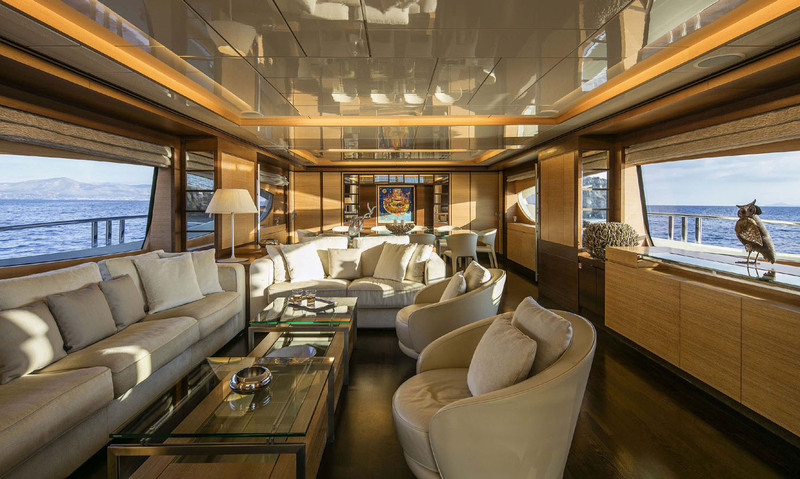 The yachts interior décor by Cantieri Navali Rizzardi has an organic and timeless atmosphere of sophistication and refinement. 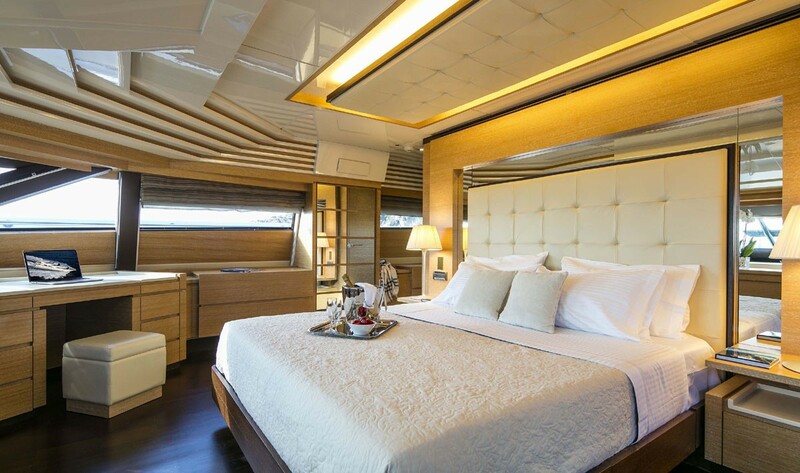 Exquisite woods and sumptuous furnishings adorn the well-appointed spaces. 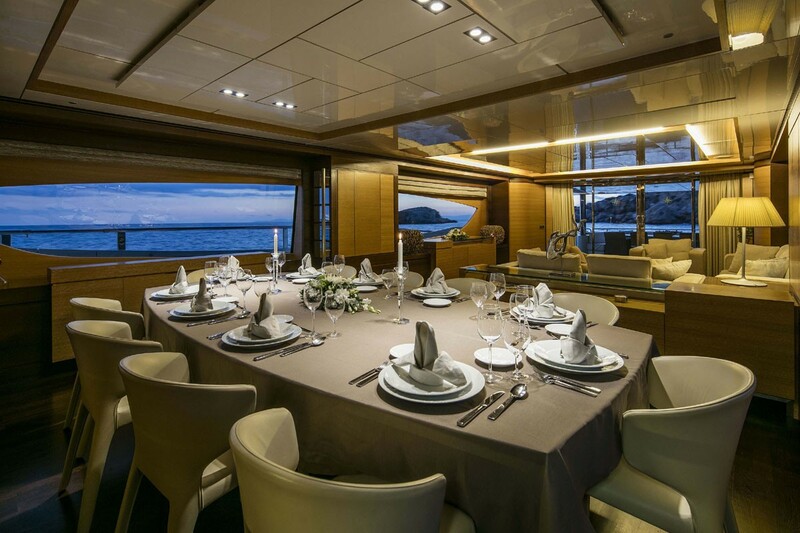 The salon and dining is set in an open plan, with a generous lounge aft and formal dining forward. 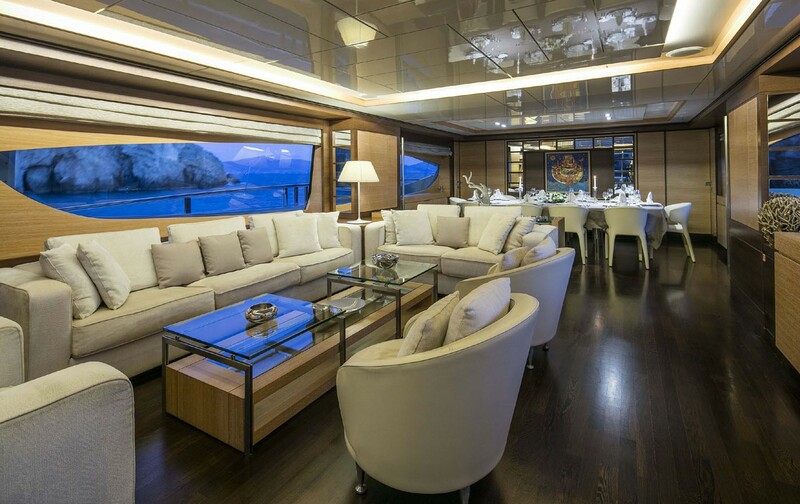 Panoramic side windows ensure spectacular views and plenty of natural light. 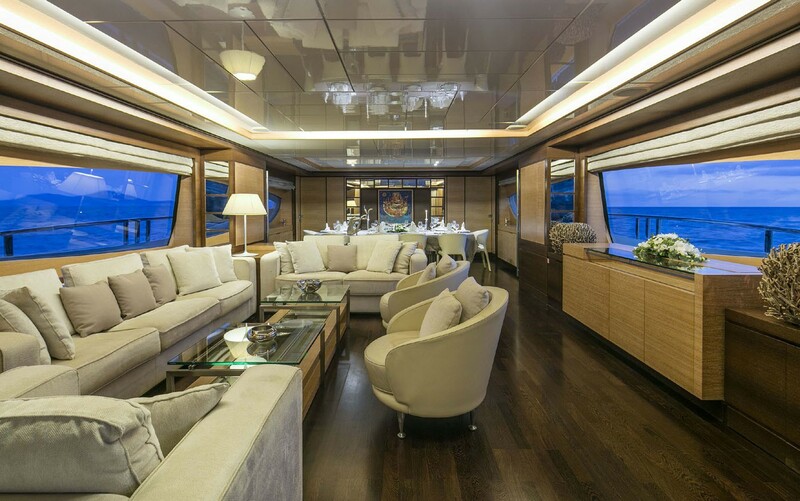 Aft of the salon are wide sliding glass doors leading to the shaded aft deck, while forward of the salon is a full beam master stateroom, complete with 180° views. 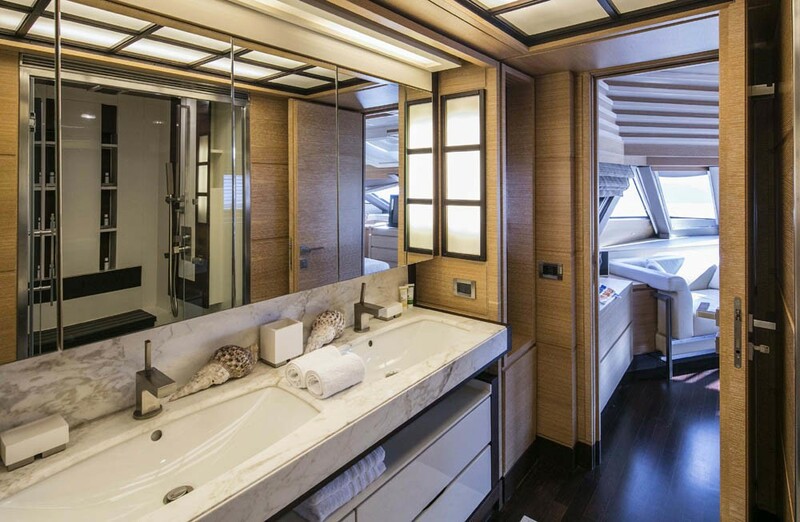 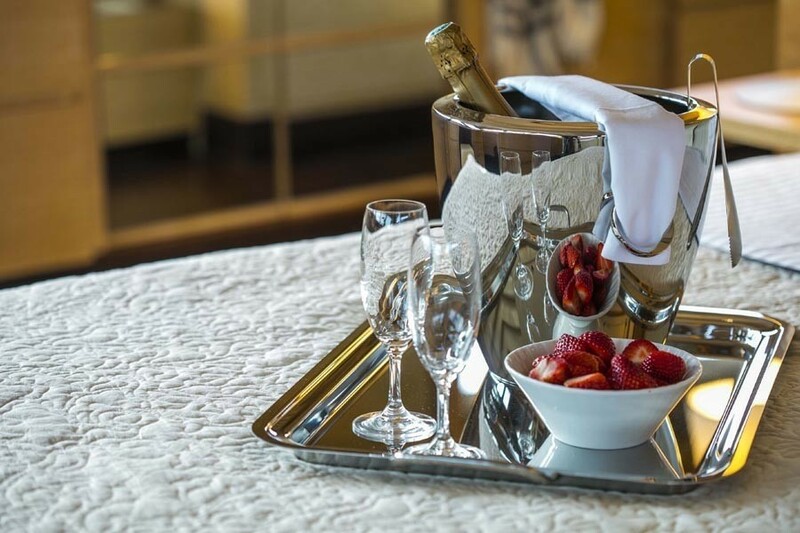 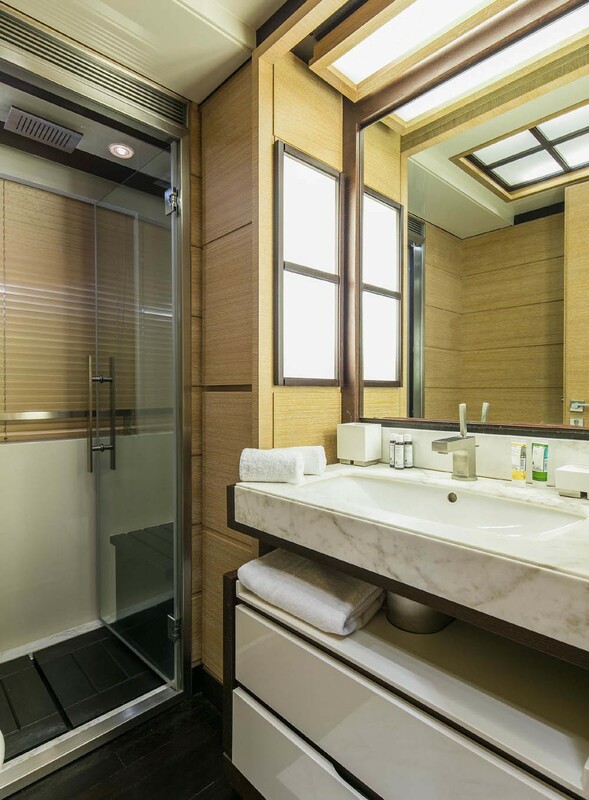 On the lower deck are additional guest cabins, each boasting private facilities. 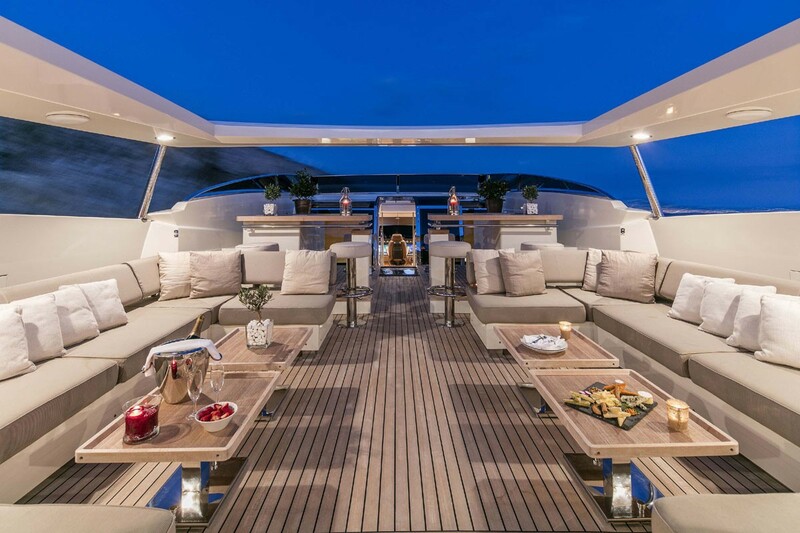 An upper deck offers a comfortable skylounge, perfect for enjoying a casual moment with a good book. Two exterior levels of teak decks provide ample outdoor areas, with a great choice of options, whether entertaining or relaxing. 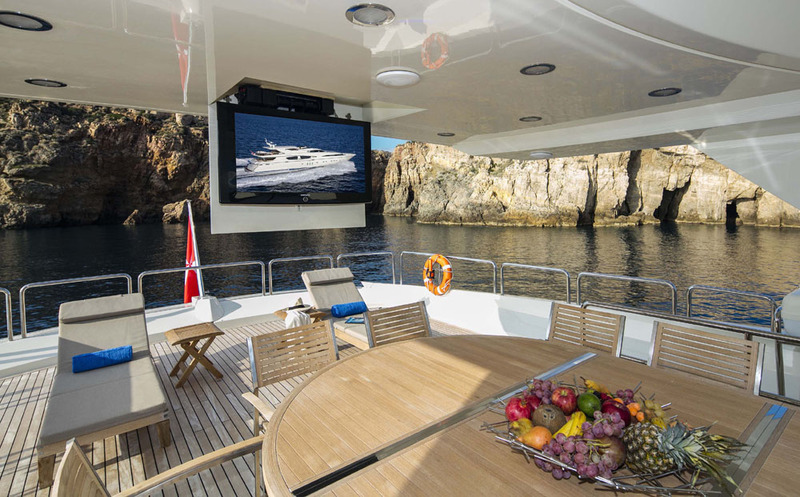 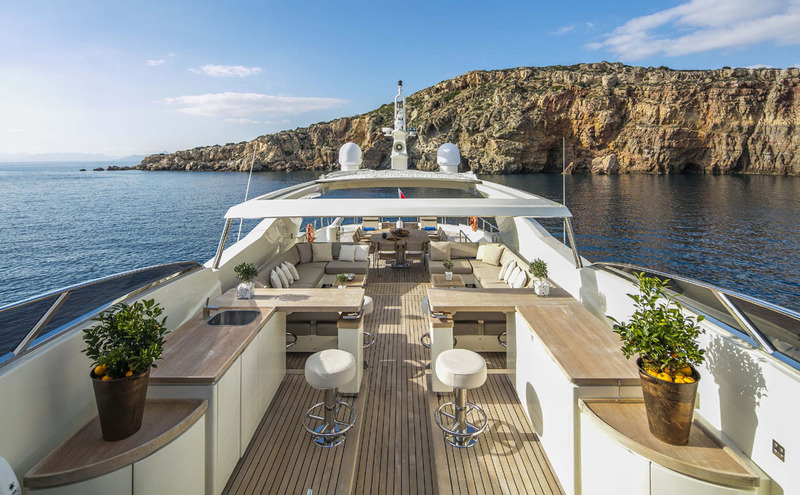 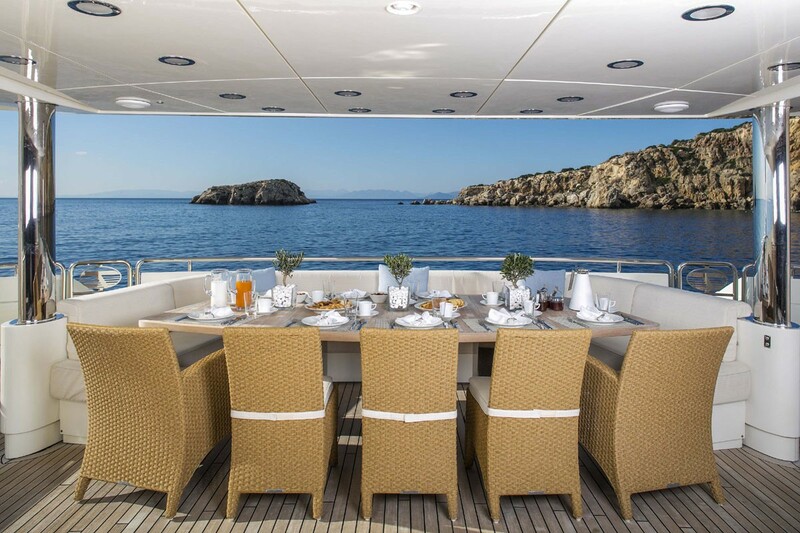 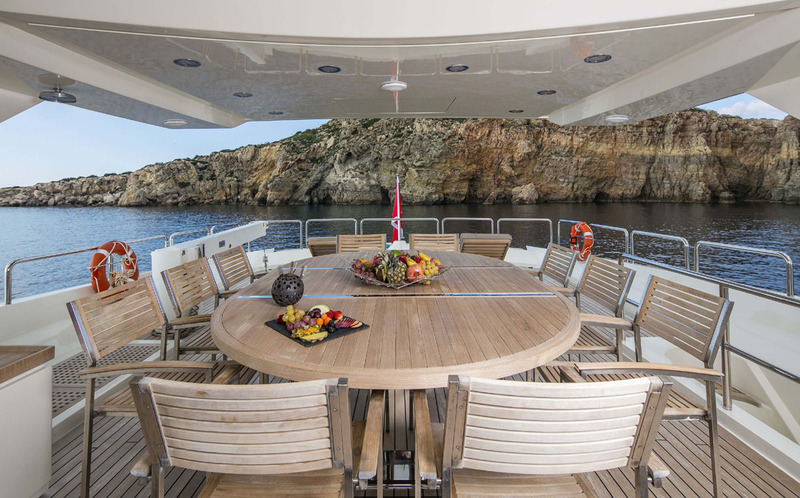 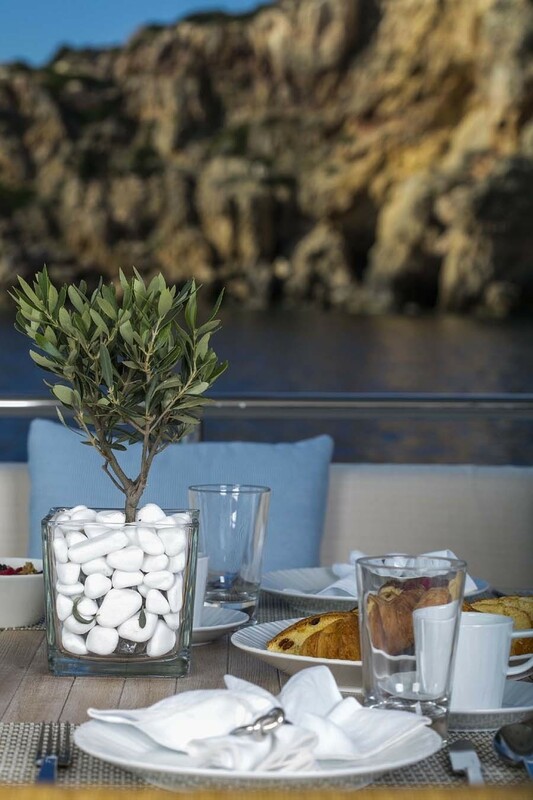 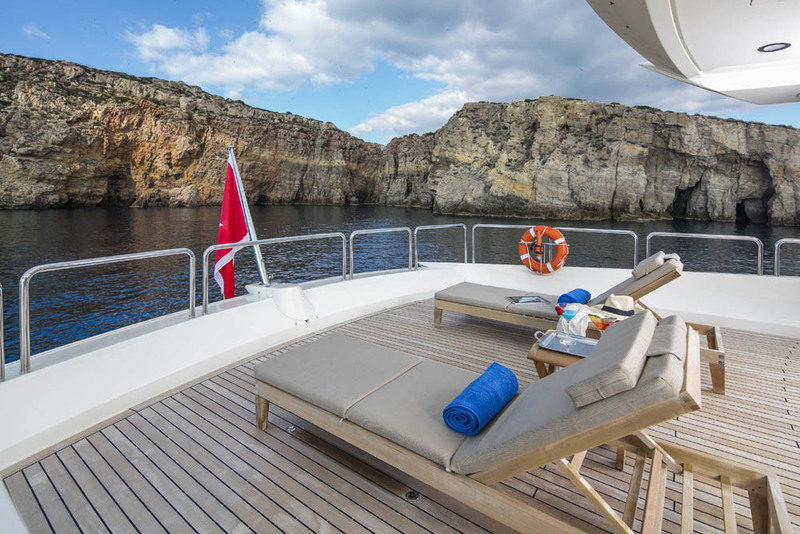 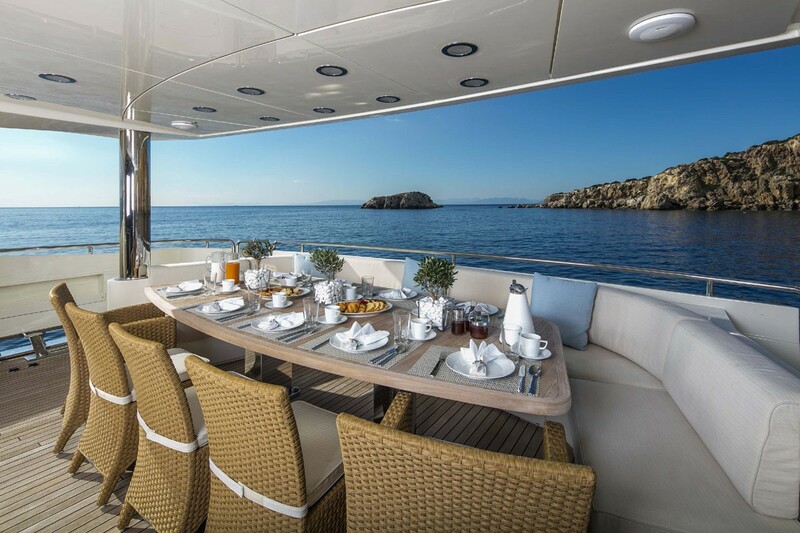 The shaded aft deck has direct access to the salon and has an alfresco dining table and seating. 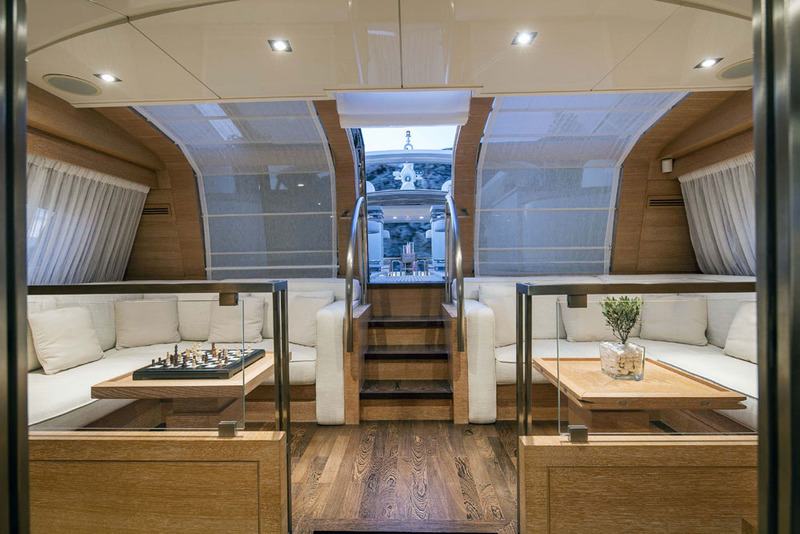 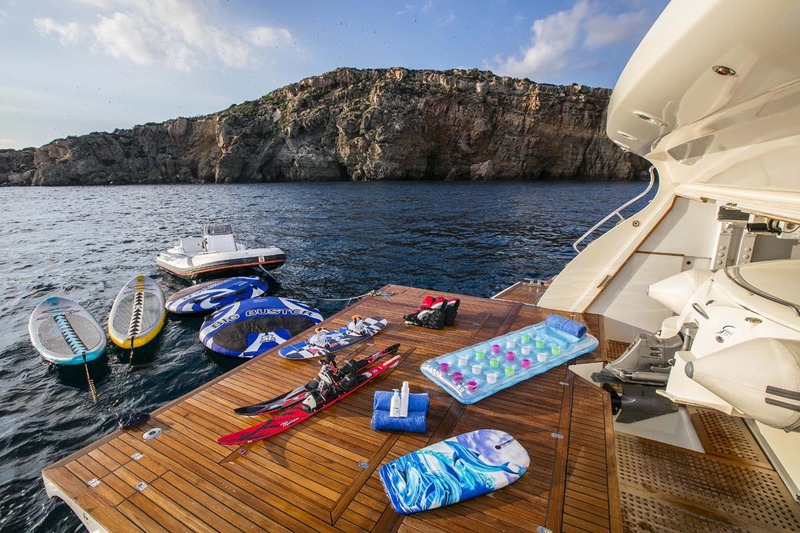 On the transom, the swim platform is transformed with an opening water toys garage, creating the perfect teak beach and water activity center. 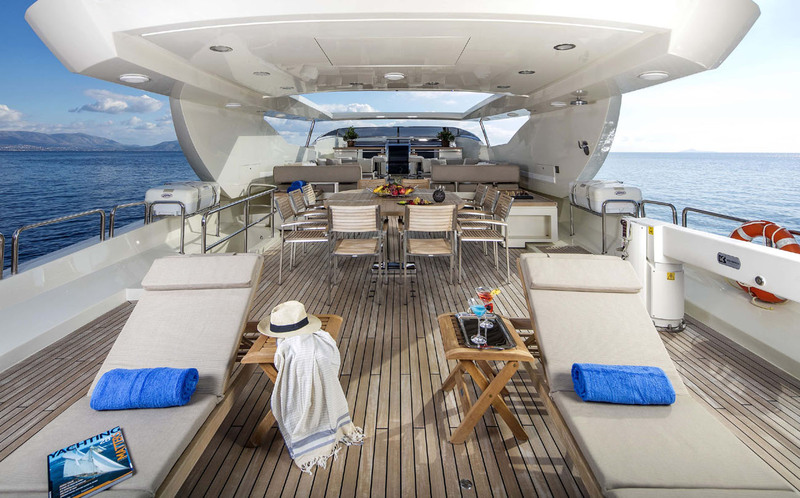 The upper sundeck is a truly exceptional social hub, thanks to an alfresco dining table, ample seating with cocktail tables, spacious wet bar and service station, drop down TV entertainment, chaise lounges, partial shade and a retractable Bimini cover. 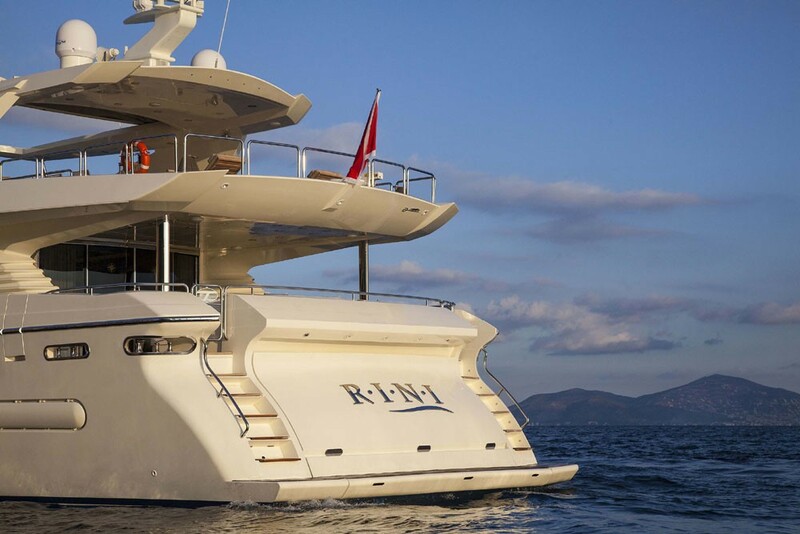 M/Y RINI’s sleek exterior style is the work of Carlo Galeazzi. 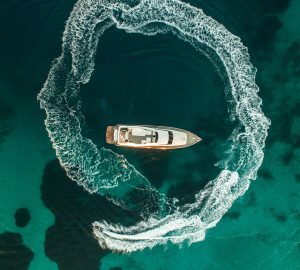 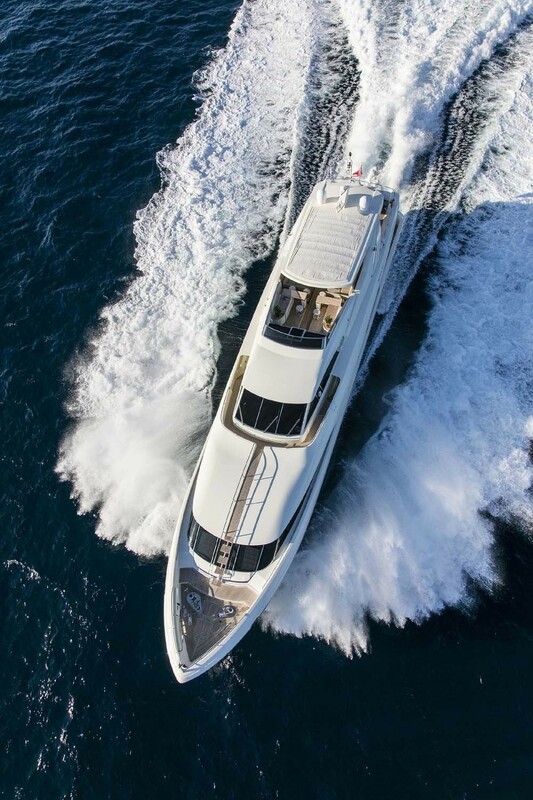 The Posillipo yacht is powered by 2 x MTU 3650hp engines, her cruising speeds are 22 knots, while the yachts top speeds are 27 knots. 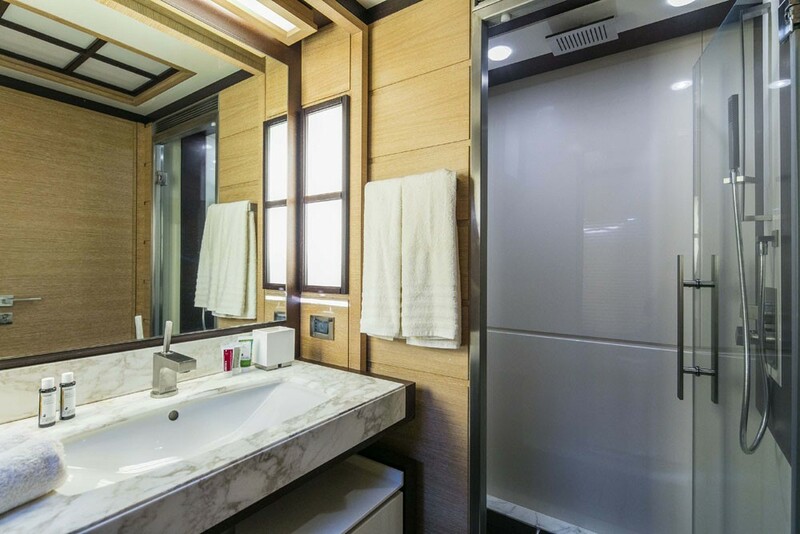 Accommodation is in 5 stylish en-suite cabins, for up to 12 guests. 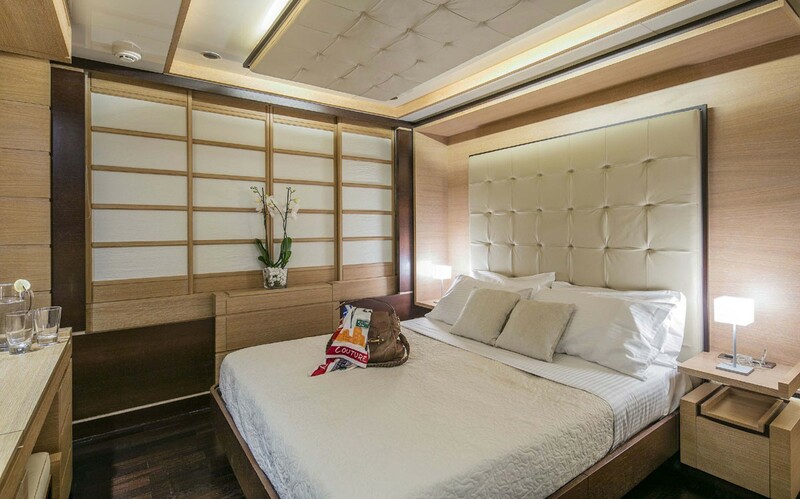 The master stateroom is forward on the main deck, with a center lined king size bed, settee, vanity and 180° scenic vistas. 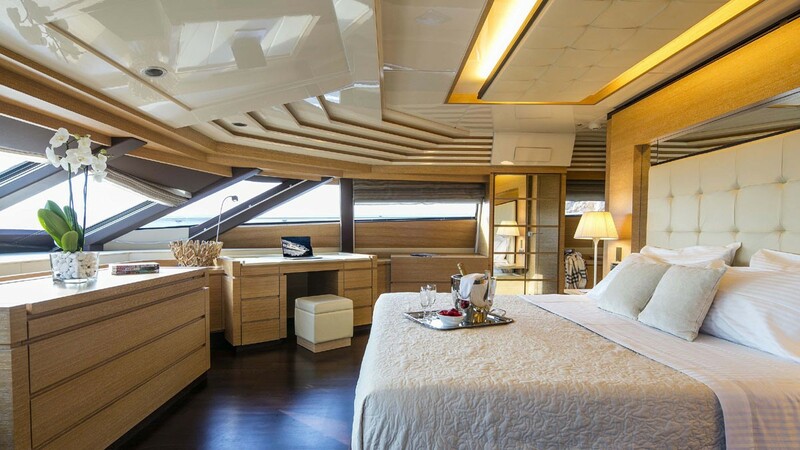 On the lower deck are 2 cabins, each with queen size beds, plus two cabins with side by side twin beds. 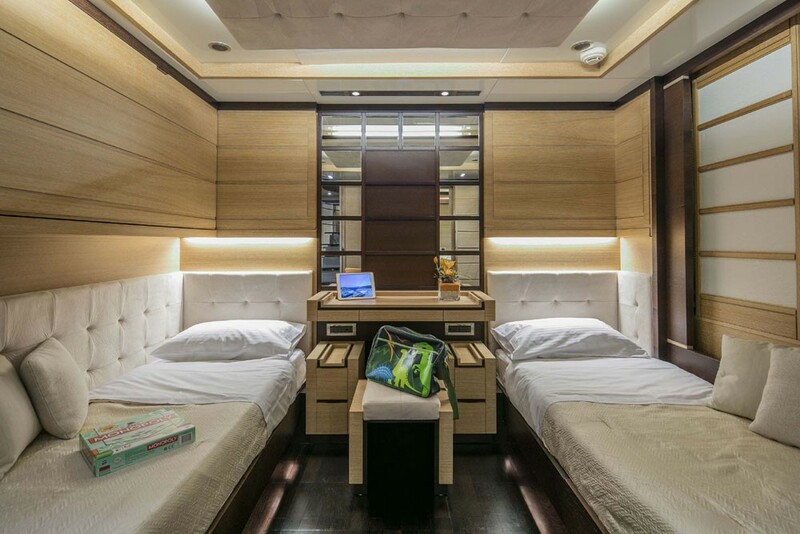 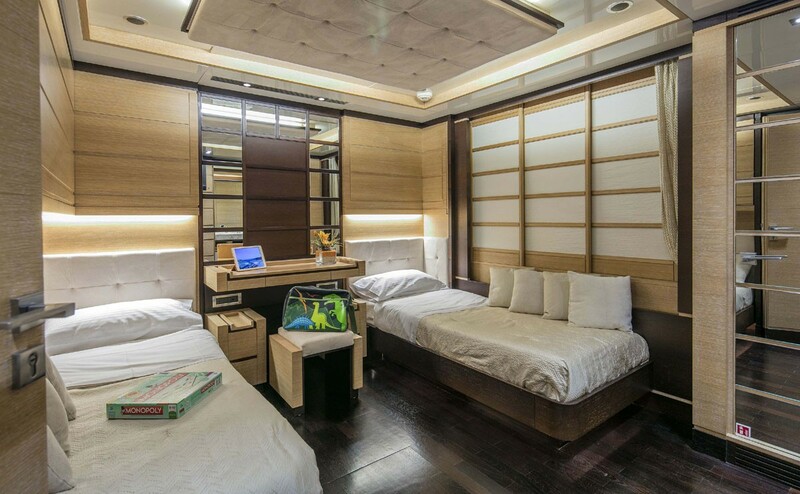 The Twin cabins offer a Pullman berth each, allowing for up to 12 guests.